Plantar fasciitis is an overuse injury that normally presents with pain on the inside and/or bottom of the heel that is worse with the first step in the morning. Pain may also increase when the toes are extended. Plantar fasciitis recovery can be lengthy and will require a gradual return to impact activities. When conservative measures have not helped to improve your symptoms,then a sports medicine physician may recommend an injection into or around the plantar fascia. Typically, the injection will include both an anesthetic, which should make your heel numb very quickly, and a corticosteroid. The corticosteroid is a potent anti-inflammatory that should give pain relief for a longer period of time. 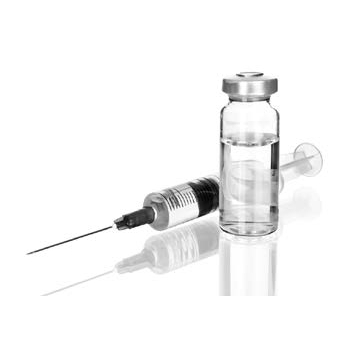 Occasionally, other substances like platelet rich plasma (PRP) may be injected. The most important thing is to seek evaluation by a sports medicine physician early in the course of your symptoms. Athletes should be sure to wear supportive footwear and to gradually increase activity/training over a period of time. Treatment and return to sport after plantar fasciitis can be lengthy. Additionally, symptoms can return if training is resumed to early or quickly. The physician may recommend cross training with non-impact activities until morning stiffness and pain is minimal. It is important not to train through pain, and to work closely with the physician to develop a gradual return to activity. 1. Ryan MB, Wong AD, Gillies JH, Wong J, Taunton JE. Sonographically guided intratendinous injections of hyperosmolar dextrose/lidocaine: a pilot study for the treatment of chronic plantar fasciitis. Br. J. Sports Med. 2009;43(4):303-6.doi:10.1136/bjsm.2008.050021. 2. McMillan AM, Landorf KB, Gilheany MF, Bird AR, Morrow AD, Menz HB. Ultrasound guided corticosteroid injection for plantar fasciitis: randomised controlled trial. BMJ 2012;344:e3260. Available at: http://www.ncbi.nlm.nih.gov/pubmed/22619193. Accessed March 11, 2015. 3. Lareau CR, Sawyer G a, Wang JH, DiGiovanni CW. Plantar and Medial Heel Pain: Diagnosis and Management. J. Am. Acad. Orthop. Surg. 2014;22:372-380.doi:10.5435/JAAOS-22-06-372. 4. Monto RR. Platelet-rich plasma efficacy versus corticosteroid injection treatment for chronic severe plantar fasciitis. Foot ankle Int. 2014;35(4):313-8.doi:10.1177/1071100713519778. 5. Ball EMA, McKeeman HMA, Patterson C, et al. Steroid injection for inferior heel pain: a randomised controlled trial. Ann. Rheum. Dis. 2013;72(6):996-1002.doi:10.1136/annrheumdis-2012-201508.